Mar is gnáth, bhí Cóisir Oíche Shamhna ar siúl againn ag deireadh an leath-téarma agus, mar is gnáth, ba ócáid iontach é! Míle buíochas do Mhúinteoir Micheál a rinne job iontach air arís i mbliana. Ghleas gach éinne suas, bhí sé fíor deacair buaiteoir a roghnú. Bhain gach duine idir daltaí agus múinteoirí an-thaitneamh as! Cinnte tá an sos tuilte againn tar éis téarma gnóthach!! 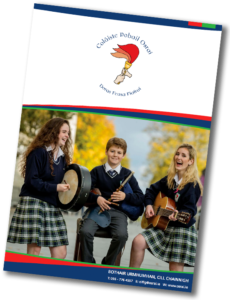 Beidh an scoil ar oscailt arís ar an 4 Samhain. Bain taitneamh as an saoire agus bígí cúramach! As always on the last day of half term, our thoughts turned to Halloween and all things scary! Many thanks to Múinteoir Micheál for his ghoulish efforts again this year organising the event. Dressing up is one of the highlights of the school year, with everyone, staff and students getting into the SPIRIT of things!! !